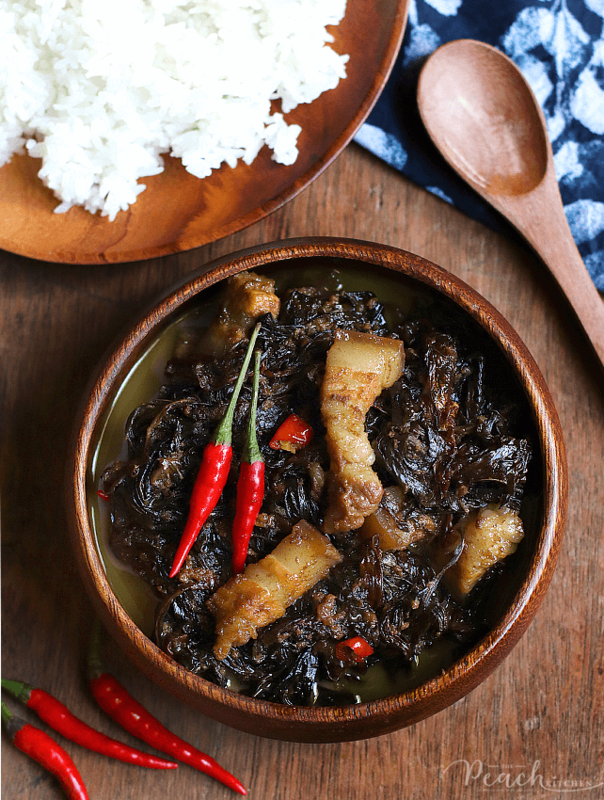 Taro Leaves in rich, creamy, and spicy coconut sauce made more flavorful with shrimp paste and pork belly pieces. This is another delicious part of my weekend — Laing with Pork. 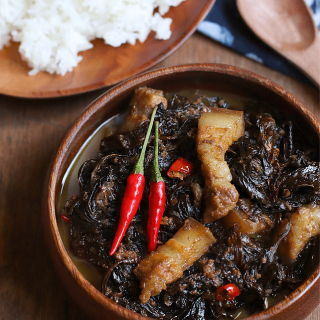 We love Laing but I don’t usually cook Laing with Pork because we love pairing it with another viand. What I do is I cook the taro leaves with only shrimp paste to flavor it and then pair it with, say, fried fish or fried pork. Last weekend, the inlaws came over to visit their granddaughter who just came from a week of being ill. Since it’s Sunday, I prepared a special lunch meal consisting of THIS and Sinaing na Tulingan which I’ve yet to share because I couldn’t get a decent photo. 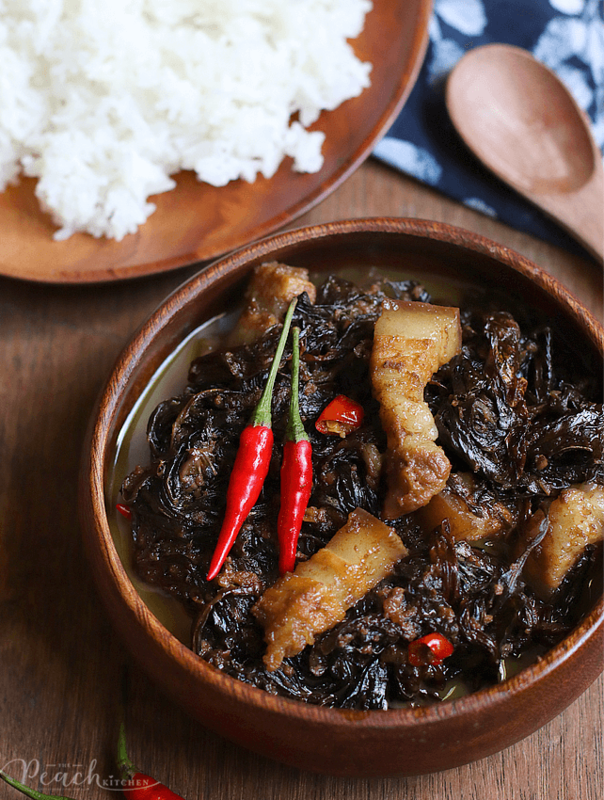 Laing is just one of my favorite dishes which I gotta eat with lotsa rice. So, yun nga, parang last sinful meal before starting my #TPK100DaysToHealth. And pinagbigyan ko lang si peanutbutter♥ to put pork belly. Our next Laings will be meat-free again, of course. 1 large bag of dried taro leaves (I think it's around 6-8 cups if you measure it. Heat oil in a wok and sauté the garlic and ginger for about 30 seconds. Add pork belly pieces and continue cooking until the pork is brown. Add the shrimp paste, thin coconut milk, and dried taro leaves. Bring to a boil and simmer until the taro leaves are wilted. It will absorb the thin coconut milk. Add the coconut milk (kakang gata) and bring to a boil again. 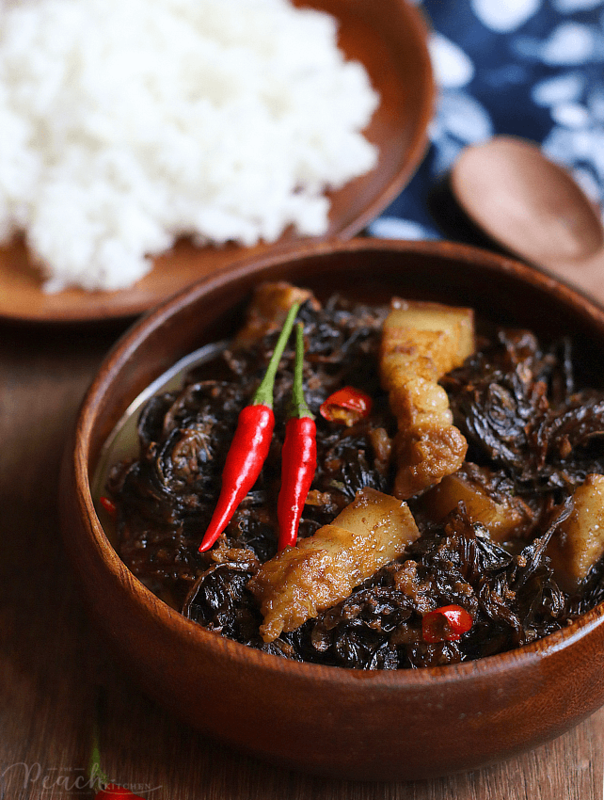 Simmer in low heat until sauce is thickened and the taro leaves are soft (around 30 minutes). Stir occasionally to make sure it is not sticking at the bottom of the wok. If you want it spicy put slices of bird’s eye chili. Season with fish sauce to taste. Wonderful looking dish — SO FULL of flavor. This looks excellent — thanks.